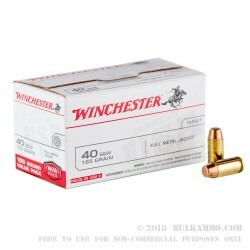 This 40 cal ammo made by Winchester is a great choice for your next trip to the range. 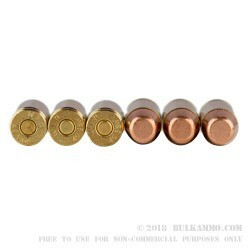 This brass cased ammo is topped with a 165 grain full metal jacket bullet with a flat nose profile. This 40 S&W ammo is built to reliably feed and be consistent from shot to shot across a wide spectrum of firearm models making it great for shooting drills to improve your firearm handling skills. 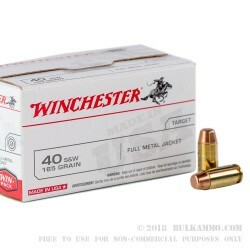 Winchester has a strong share of the 40 cal contract market with government agencies and law enforcement complete with a great lineup of range ammo such as this load as well as great product lineup of duty (JHP) ammo. This ammo is brass-cased, reloadable, and non-corrosive and is staple range ammo. With over 150 years of experience in the firearms and ammunition space Winchester is continually honing their skills to keep improving to meet the needs of the shooting community. Good value, fast delivery, 100% reliability so far! Shoots straight, nice load, 500 rounds without an issue. I bought this ammo on bulkammo.com in December 2013. The ammo came to oklahoma within 3 days. It was packaged well and there were no issues with the UPS delivery. The ammo is packaged in boxes that hold 50 rounds each. The individual rounds are set into heavy styrofoam trays inside the boxes with almost no possibility of damage. Q: Looking for a grain for target practice.. What do you recommend ? Plus, what does fmj, fmjfn stand for ? A: Hi Robert, For .40 S&W, I would say 165gr. or 180gr. would work great for you for target practice. There isn't too much of a difference between the two. The 165gr. will typically have a slightly higher velocity than the 180gr. For your second question, 'FMJ' stands for 'Full Metal Jacket', which denotes that the projectile is encased in a copper jacket, and 'FMJFN' stands for 'Full Metal Jacket Flat Nose' which means that the nose of the projectile is flat as opposed to a round nose.